Here is the two Amaryllis plants that I have, they are both new and my hubby got them from Lowe's, I am not sure which is which right now but one is a Red Lion and one is Star of Holland. The one has grown nothing but leaves as you can tell and the other one has a reddish color to its stem. Got a question, just because it grows leaves first does not mean it won't flower, right? Not necessarily. I've got one that is just now sending up a bud but the leaves grew over a month ago. The other picture is the tub of amaryllis bulbs. I'm still trying to get hubby to put lights on the shelves. Everything is leaning quite a bit because the ones in back don't get enough light. But the nice thing about amaryllis is that they are so forgiving in that regard. As long as they get good strong light and fertilizer during the warmer months they grow and flower the next year. Have you ever heard of using hydrogen peroxide mixed with water to kill fungus gnats? Never heard of using peroxide to kill fungus gnats. Just did a little search and some say it works, others say it doesn't. I guess it won't hurt to try it. I wonder if it will get rid of mealy bugs as well. I've had a lot of trouble with them since I brought some home on some clearanced orchids. I was at the thrift store today and ran across an amaryllis bulb in a nice glazed ceramic pot for only 50 cents! The bulb looked dead but was firm at the bottom. When I got it home I peeled off the dry skin and found the leaves were just starting to come up. I tore a tip off one but it will recover. Now I just need to get it potted up and set under a light. Hubby put the light on my plant rack over the weekend. So now the plants on the shelf should start standing straighter and get darker leaves. The one that has the flower stalk is stating to open, so anxious to see what it is going to be! Nothing but leaves on the other one though. Bad news about the peroxide, it didn't kill the aphids on my ornamental sweet potatoes and it burned the leaves on the pineapple sage and the fern mayii next to them. This was 3% peroxide diluted with water at a 3 to1 ratio. It doesn't seem to harm the amaryllis but I haven't had a chance to check the ones in the tub for mealy bugs to rate the effectiveness as an insecticide. And I still see fungus gnats flying around despite the tub and other nearby plants being dry enough to wilt. I usually don't take my Amaryllis bulbs out of storage until the end of January but I had a couple that were determined to wake up so I watered them and put them upstairs. Beautiful! I like the graduated shades and darker outlined petals. The bulbs that I put into dormancy are not doing anything, Should I toss them out or keep them? I keep them on the floor where it is cool, and dark but nothing so far. And the one that I potted up from last summer does not have any growth on it at all. What should I do? Are you watering them? If yes, stop. If not then don't until they show some signs of growth. I have found that getting them to come out of dormancy in the winter can sometimes be difficult. They will eventually wake up and grow but on their own terms. Remember that the ones you buy in the fall have been strictly climate controlled to ensure that they bloom in the winter. As long as the bulbs are solid they are still alive. Spring will eventually arrive and you can set the pots outside where the warmth and sunshine will wake them up. thank you butterflylady29, sometimes I get impatient. If the bulb is still solid just put it in more light and in a warmer spot to wake it up. Give it some bulb food and wait. 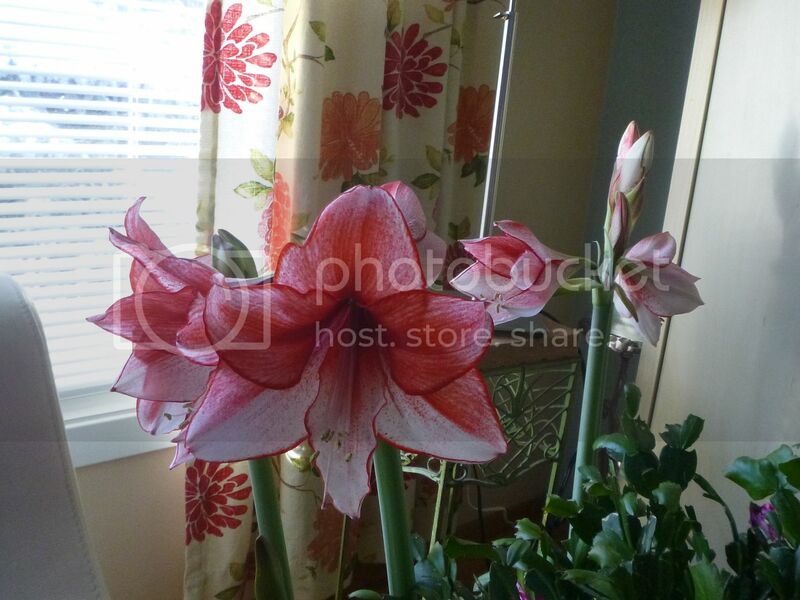 Actually amaryllis will bloom once the bulbs are large enough with or without leaves. However, if you want to force and amaryllis into bloom, just cut off the leaves and repot it if the bulb is large enough. 2 of my Amaryllis from last year are starting to grow!